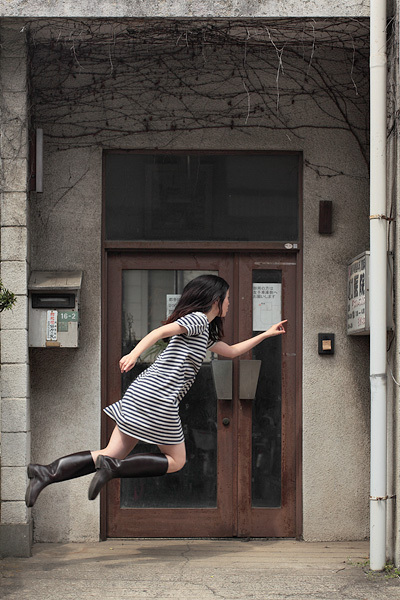 Thanks to a really cool slide show featured on Yahoo News the other day, I became aware of an incredible photography blog called yowayowa camera woman diary. The idea behind the blog is simple, but the execution of the idea, I'd imagine, is anything but. Each post on the blog is labeled, "Today's Levitation," and as you can see from the photo above, that's exactly what photographer Natsumi Hayashi aims to do in each photo--"levitate." There are some super cool shots on her blog, and I hope you take the time to check it out, because I had a lot of fun going through the site. Also, keep in mind that Hayashi is not using PhotoShop on these--she's jumping and employing the age-old adage of "try, try again" until she gets the photo to look just right. That...is a lot of jumping, I'd think. So go check it out, already! Also, enjoy your Sunday and we'll be back tomorrow to kick off another Internet-breaking week of geek.